On May 1, 1945 the Yugoslav Partisans led by Josip Broz Tito, the Communist dictator of Yugoslavia, entered the city of Trieste and began the brutal 42-day occupation known in Italian historiography as the “40 days of Trieste”. During these days the Yugoslavs committed many massacres and atrocities. Several thousand Italians from Trieste disappeared – simply vanished without a trace. Later it was discovered that many were arrested and sent to Yugoslav concentration camps, from which they never returned, while the rest were murdered and dumped in mass graves (part of the Foibe Massacres). The Italian population was terrorized in various other ways as well. The northeastern region of Italy is a graveyard, filled with thousands of victims of ethnic cleansing who perished at the hands of the Yugoslavs during and after the Second World War. During Tito's occupation, the city of Trieste was transformed into one large concentration camp. Just as the Slavs had done in Dalmatia, Istria, Fiume and the rest of Julian Venetia, Tito tried to “make Trieste Yugoslav”. He sought to violently ethnically cleanse Trieste of Italians, replace them with Slavic people and annex the city to Yugoslavia. He was only prevented from doing so by the Western Allies, who assumed control of the city on June 12, 1945. Trieste remained under Allied occupation until October 26, 1954, when it was finally reunited with Italy. The return of Trieste to Italy was met with joyous celebrations. Since then, Trieste has remained one of the most patriotic cities in Italy... except for a minority of disgruntled Slovenes who still live in the suburbs outside the Italian city, inhabited since ancient times by an Italian majority. On May 1, 2016 – precisely 71 years after the Yugoslavs entered Trieste – groups of Slovenes wielding Slovenian and Yugoslav Communist flags held a procession in Trieste. The flags they were carrying were not merely Yugoslav national flags, but specifically flags of the Socialist Republic of Slovenia, one of the constituent republics of Communist Yugoslavia. 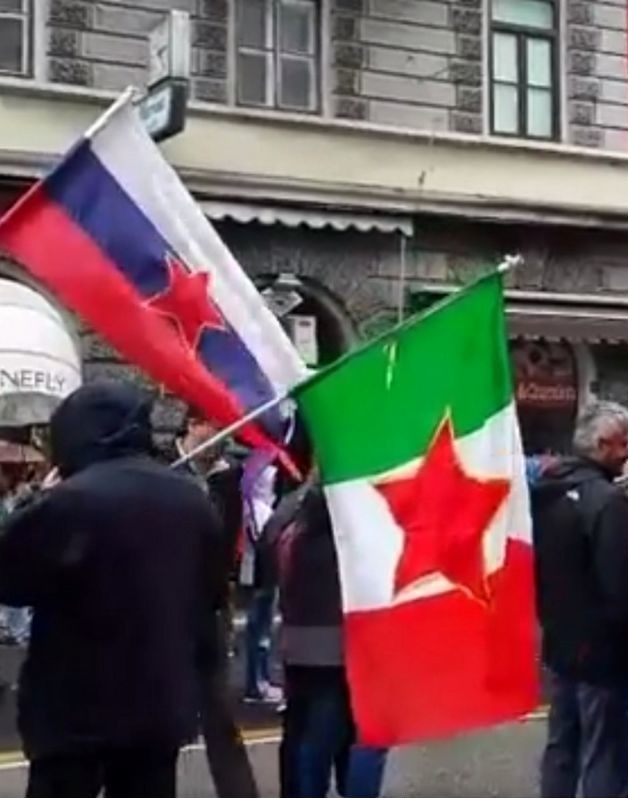 They were joined by people bearing the Italian flag with the Yugoslav red star superimposed over it (the same used by Tito's troops when they occupied Trieste), and by a group of Communists holding a banner (written in Italian and Slovene) of the Communist Refoundation Party. The nostalgic demonstrators marched to show their support for Communism and Tito. The same Tito who founded a Communist dictatorship and led a country built on genocide and terror; the same Tito who targeted Italians for ethnic cleansing; the same Tito who led bands of partisans who committed innumerable massacres, rapes and violent crimes throughout Italian territory; the same Tito who later even imprisoned thousands of left-wing Italians and their families from Trieste and the Julian region (most of whom were socialists and supporters of Tito who naively volunteered to work in the “Socialist utopia” of Yugoslavia) and deported them to the Goli Otok concentration camp, a Yugoslav Gulag located in modern Croatia. 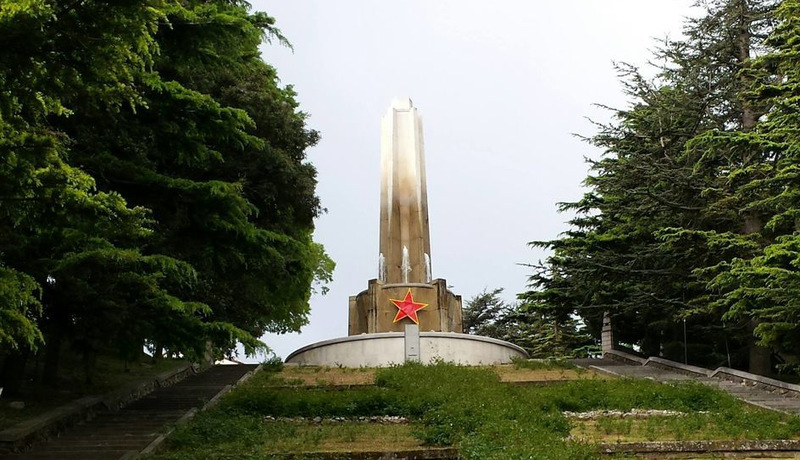 On May 2, 2016, a day after the nostalgic parade, the fountain on the Hill of San Giusto, in the heart of Trieste, was vandalized when someone pinned a large red star – the Communist symbol of ex-Yugoslavia – to the monument. 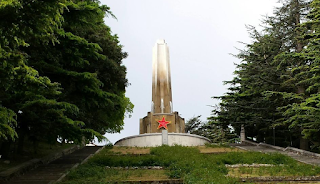 The red star is a symbol of terror which recalls the painful memory of the occupation of Trieste, the Foibe genocide, Yugoslav gulags, concentration camps, and the expulsion of 350,000 Italians from their homes in Julian Venetia and Dalmatia. Marching in the streets and vandalizing Italian monuments: these actions are a provocation on the part of the Slavs in Italy, specifically the Slovenes, who still harbor hatred for the Italians and dream of Yugoslav imperialism. This is not the first time this has happened either, far from it. This is only the most recent demonstration of political agitation and provocation by the Slovenes. There have been many dozens of other actions in the past whereby the Slovenes demonstrated their hatred for Italy, hatred for Italians, and support for extremist nationalism and Communism, which is still very much alive and prevalent among the South Slavs today. It is emblematic that since 2011 the President of the Communal Council of Trieste has been Iztok Furlanič, a Slovene (the first ever to hold this post), descendant of Partisans, who is also a Titoist and provincial secretary of the Communist Party. This would have been unthinkable a few decades ago, but this is the current twisted political climate in which the Italian people are forced to live. 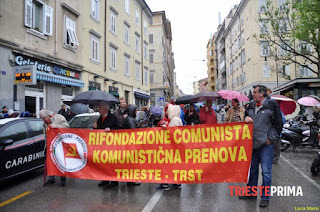 Holding a Titoist demonstration in Trieste, especially on May 1 or April 25 (or any other day), while wielding Yugoslav Communist symbols, is no different than holding a Hitler rally with swastikas at Auschwitz on Holocaust Memorial Day. If such an event were to occur it would immediately make international headlines and the Jews of the world would be horrified and outraged. But when the equivalent takes place in Italy, it barely makes the Italian news, let alone international news.